One of the benefits of Invisalign orthodontic aligners is that they can be removed, which allows patients to brush and floss like normal. However, it's important to clean your aligners, too. Here’s how. Rinse your aligners thoroughly each time you remove them. Don't give bacteria a chance to develop by leaving dried saliva and plaque on your aligners! Be sure to always use room temperature or cool water when doing this, as hot water may damage your aligners. Brush and floss your teeth before you put your aligners back in so that the leftovers from your lunch don't get trapped in the tight spaces between your aligners and your teeth. It’s a recipe for bad breath and decay. Brush your aligners when you you brush your teeth. Using soft soap and a toothbrush, clean them inside and out thoroughly but gently. Then rinse with cool water. Soak your Invisalign aligners every week in the official Invisalign cleaning crystals, or in Denture cleaner, Retainer Brite, or just white vinegar to remove any buildup and to keep your trays sanitized. All this may seem like a lot of work, but getting into these habits is essential for your oral health during your treatment, and by extension its ultimate success. 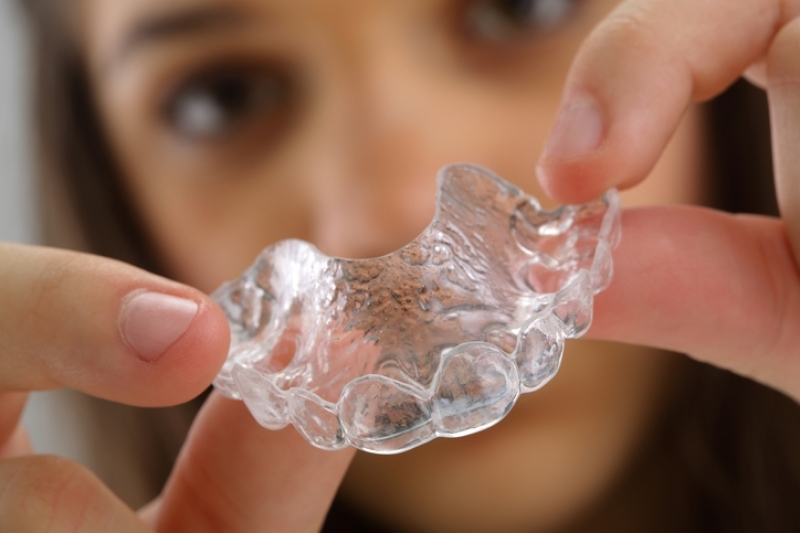 Contact Guildford Orthodontic Centre today for more information about Invisalign, and how to care for your aligners.